The general concept of the project is part of a series of experimental performances began during the workshop Artur Zmijewski held at the Civic Art Gallery “Montevergini” – Siracusa (I). My research is inspired by forms of expression, which are aimed at sensorialization and reflection “with / other.” There is a deep-rooted fear towards “the other as if”, “unknown”, which is directly attributable to the theory of the “uncanny” Sigmund Freud. So I focused my eyes on the activation of processes that can overturn habits made static without a reason, triggering mechanisms of opening psicofisica through the outside, “the other”. Feed / touch develops in an interactive performance that is right in the food – element of exchange, sharing, clarification of their culture and of their more intimate feel – the essential element for “approaching the other” and his understanding . A long table and chairs placed with its back turned against the edge of the table, a number of six participants (contacted through personal invitation) was sitting to eat their dinner. 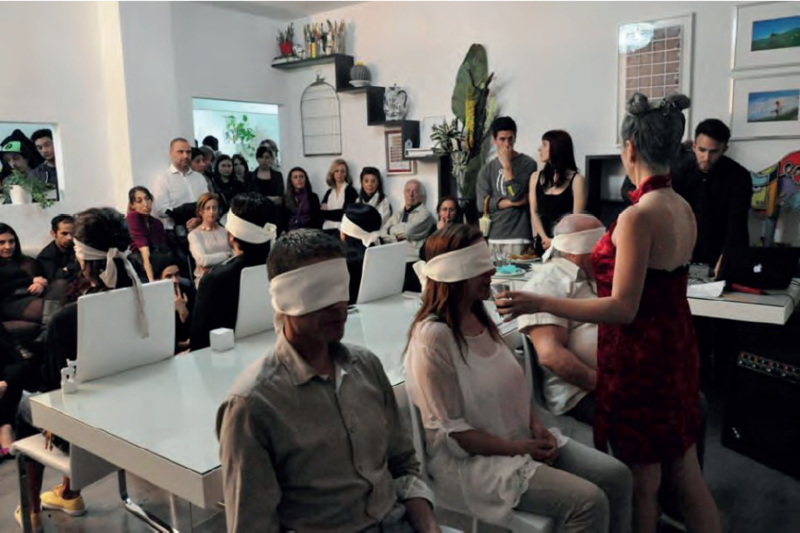 Peculiar is the way to carry the meal, as participants at the dinner would be blindfolded and spoon-fed to me with different parts of my body and in different ways that imply the need for a contact psycophisical consuming food. The changing of the individual with whom you will come in contact will be a different stimulus for the establishment of a report which is almost impalpable synesthetic. Also I will use the objects function as tactile stimulation of the memory, for amplify cognitive and sensory perspective. This way I will try to create from nothing a relationship of confidence or simply a relationship with me and among the diners. Tiziana Contino offers the Apartment LAKE Pescara performance Feeding CON / TACT, in which, starting from the pleasure of conviviality, back to the primordial state of nutrition, until take directly the public. If Francesca Lolli CibAzione is the sharing of a social issue and Lacedra is deprivation and complaint, with Tiziana Contino it becomes dinner anthropophagic in which the artist’s body is offered as food and nourishment.